A resume without a summary or outline is like a body with no heart. 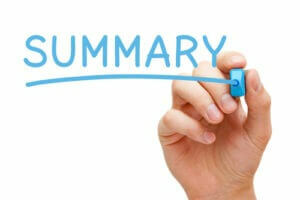 Summary has a direct relationship with your resume. Well here are few steps to make a charming career summary for effective outcomes, when it’s lying beside many career resumes at a recruiter’s desk. The more deeply you can focus on your profile to the recruiter’s needs, the better your results will come out of it. Begin through looking for jobs for your perfect position that fits to your core competencies. Analyze the advertisements and compose bullet points of normal employment prerequisites, favored qualifications and so on. Focused around your analysis, how would you evaluate? How would you help potential recruiters to see their objectives? Other than the qualification illustrated, do you propose any special reward? In the event that you are missing in any region, do you compensate for it with different accreditations? These are the questions which have to be answered and present it accordingly. Further, in case that you are having some major difficulty evaluating your abilities, get help. Ask your associates, teachers and directors what they see as your key capabilities and credentials. Next, survey your performance assessments and analyze what do others say in regards to the excellence of your work? At that point write down your main five attractive endorsements which hit the market demand as often required by recruiters or organizations. The following step is to weave your top qualifications into your job summary. Remember that it helps the recruiter to figure out whether you ought to be required for an interview or not. Incorporate an abstract of your profession accomplishments to demonstrate that your devotion is adaptable to your next management. Clarify clearly that how you would help tackle their matters. Question yourself, “By what ways will the association profit from contracting me?” Highlight all the areas. A caption, or your CV title, captures your recruiter and impels them to keep going through till end. Remember that a feature or title ought to complement in your job focus and also the fundamental profit of employing you. It has to be eye-catching and free from grammar mistakes. As a truth, the best summaries always focus on one profession objective. In the event that you have more than one conceivable target, reflect enlisting diverse renditions. Your profile can likewise incorporate a bulleted “Significant Skills” segment, which contributes a best simple to-peruse posting of your essential abilities and skills. Initial introductions are enduring impressions. Is your summary influential and free of blunders? Is your tone proper for your respective field? Maintain a strategic distance from unfilled, summarize-up articulations, for instance, “excellent negotiations skills.” “Best Team Leading Skills” and so on. Skim through to get an idea for overall understanding correction of it where necessary. Whereas, scan for the factual points you have added in to make sure either all are enlisted properly or not. It is the fact that we usually don’t get lot of time to apply. So we need to be a little faster to do this process to remove grammatical errors and make it more cohesive. Last but not least, here is a sample of a successful profession summary of an accounts professional for your better understanding. • Carry out branch audits, trading compliance and ensuring legal and liaise with external auditors respectively. • Effective application of numerous projects including RF technology, price drop launch and simple warehouse resulting in up to 80% accurate, timely completion of price changes, 24% growth in branch revenue and 29% overstock reduction. Member of one of the most admired global accountancy bodies (ACCA). I have worked through different work levels including Assistant Branch Manager/Deputy Manager at Tesco Plc (UK) during my 5 year association with the company. Currently, I am working as an Accountant for a Group of Companies in the Oil and Gas sector for the last six months. I wish you good luck for your future. Thank you for your time for reading. Angelina is an experienced writer who contributes in different educational forums to assist students. These days, she is contacted with Done Coursework to facilitate students with her great knowledge and writing skills.